Does Blend do international cuisine catering? Oui-oui. Sí. Hai. Shì-shì. Ken. Shore, you betcha! Our careers as chefs have been an incredible journey, taking us across the continent from the Culinary Institute of America in New York to Napa and San Francisco to Reno / Lake Tahoe—sometimes even literally, when you count our food truck days—and we’re proud of all the flavors we’ve soaked up along the way. But at Blend, our specialty is variety. And while we love us our American classic comforts, nothing thrills us more than introducing our clients’ palates to new flavors. To do it, we look all over the globe for inspiration. Want to impress la familia? Enjoy a caprese salad with Nevada-grown heirloom tomatoes, buffalo mozzarella and fresh basil. Don’t forget the house-made Bolognese with tagliatelle, parmigiano reggiano and porcini. Having a fiesta? Let’s celebrate with a full taco bar full of meats like cinnamon-and-ancho-rubbed filet mignon, slow-cooked carnitas and chipotle chicken. Cruisin’ for a little Asian fusion? How about a Korean short rib skewer with kimchee, peanut and crispy shallot? Along with some General Tso’s crispy tofu and grilled pineapple? Enjoy a snack-tastic trip around the Mediterranean with spicy hummus and homemade babaganoush… or falafel and freshly citrused tahini… or Moroccan spiced lamb shanks! If we got stamps for all the globe-spanning flavors we cook with, we’d need new passports all the time. But no matter how far around the world we reach for a culinary revelation, we keep all our recipes close to home with the freshest ingredients available. From locally-raised meat to Nevada-grown goodies to herbs and veggies sprouting right here in our own Blend garden, we make sure our international dishes travel as little as possible. 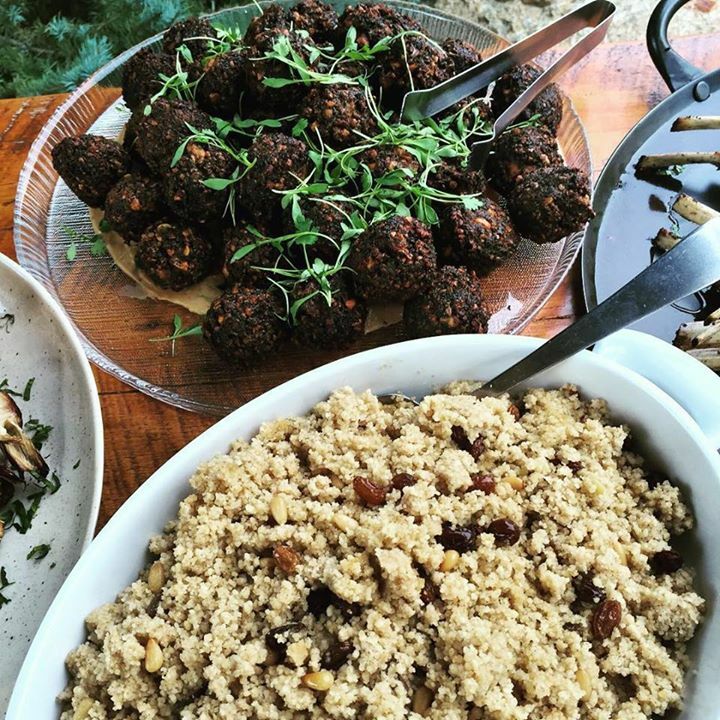 So next time your event calls for a creative menu of specialty catering inspired by any part of the world–from Tahoe to Timbuktu–call Blend! In the meantime, click over to our Facebook photo album for some scrumptious pics of some of the dishes we mentioned!